The best approach to improving your processes and delivering better results. We can guide you through every step of your Lean Six Sigma journey irrespective of whether you are just starting or are moving into a new phase. We can help you decide on the approach best suited to your organisation. We recognise that everyone is different and faces different challenges. We are highly flexible and are not fixed to particular ways of providing support. We deliver a series of progressive training courses from Yellow Belt, through Green Belt and Black Belt. We regularly configure training to meet specific client requirements. We also provide introductory executive awareness workshops and champion training. Answering: Are we ready for Lean and or Six Sigma? Linking Lean and Six Sigma with your other initiatives e.g. your strategic programmes, EFQM, employee engagement and whatever else you have already going on. We believe that effective problem solvers command the right balance of ‘hard’ and ‘soft’ skills. Lean Six Sigma practitioners need to be able to inspire, motivate, and lead people as well as manage projects and implement fixes. 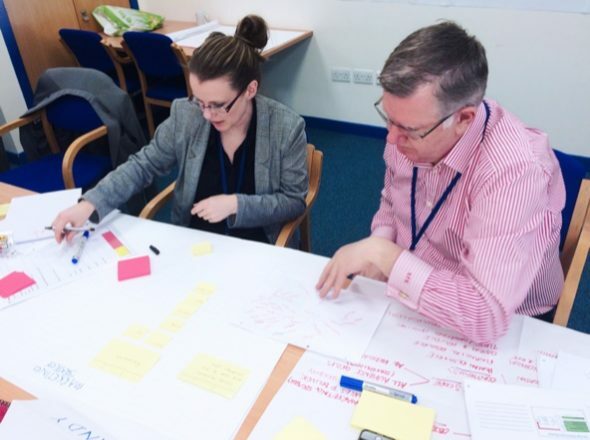 Hence our training goes beyond the steps involved in problem solving and data analysis tools and incorporates the wider aspects of managing change with teams of people. Our aim is to develop results oriented practitioners who know as much about engaging and ‘releasing’ people as they do about ‘controlling’ processes. We believe that the application of Lean Six Sigma techniques is limited only by ones imagination. Despite starting from a manufacturing base, the techniques are just as relevant in the service sector. Some might even say that the opportunity here is greater. Public and Private sectors alike stand to benefit from the application of this methodology. Our training content is full of examples from both service and manufacturing so that it appeals to and has high relevance in both areas. We come from the school of thought that says – people will learn more if they are enjoying themselves. Hence our training courses are highly interactive with imaginative hands-on exercises. Participants get to grips with the theory via practical application exercises. We continuously develop these learning tools to keep them fresh and relevant. Our standard Lean Six Sigma ‘package’ is ready to go. However, we would normally talk to you about your particular requirements and challenges so that we can make the approach as relevant to you as possible.